That kind of thinking totally misses the point, because Twitter is a network of networks. an almighty thing when it’s in full swing. Raising awareness in a meaningful and relevant way is what Twitter is all about, as far as our business is concerned. It is crucial to own / control as many first page search results for your own company / brand name. Sites like YouTube, Slideshare and LinkedIn are easy wins, as far as universal search goes. Twitter is another way of claiming one of these slots. Twitter is always in the first five results for a Google search on ‘Econsultancy’. Seriously amazing things. Read my analysis of how Mahalo came out of nowhere to rank highly for ‘answers’, to support Mahalo Answers (which only launched in December 2008). It did this by setting up www.twitter.com/answers. There are half a billion results for the word ‘answers’, and the Mahalo Twitter account sits at the top of the second page. Mahalo made Twitter a part of its business: you can ask questions via Twitter, and it posts answers via Twitter. This was a smart move, not least because it encourages a lot more activity. In eight months @answers has posted almost 54,000 tweets. Ask yourself whether 54,000 tweets and a third placed result on Google (for a ridiculously popular keyword) is a coincidence? Personally, I don’t think so. Consider that there are 54,000 individual pages on Twitter all pointing at @answers, as well as to Mahalo Answers. One tweet = one page; one page = one link to the homepage, and one link to the source of the tweet client (e.g. ‘Tweetdeck, or in this case ‘Mahalo Answers’). Points make prizes. More followers help create more internal linklove to your Twitter homepage, as well as to individual tweets. Frequency and reach! Big deal. Step back and see the bigger picture. Twitter drives reach and awareness in what you’re up to. It’s as much about encouraging your followers to spread word – and create new links – on other sites that do not bother with Nofollow. Andy Beal has some good ideas on why Twitter and Google need to dump the Nofollow protocol. This follows on from the last point. By creating compelling / useful / valuable content you can generate a lot of retweets, which – for link-based tweets – can mean lots of visitors. Traffic is one thing, but again it’s about the bigger picture. We live in a world of bookmarklets, and there is a large blogger community on Twitter. Links, links, links. One of my posts on measuring social media success generated more than 1,000 retweets, which in turn delivered 30,000+ visitors. Those people also wrote about it and bookmarked it on sites like Delicious (about 600 times), StumbleUpon, Sphinn, Digg and FriendFeed, which in turn generated yet more traffic, links, interest, and Econsultancy subscriptions / registered users. Your username (e.g. ‘Chris Lake’) is where the money’s at, so to speak. Your brand name / keywords should live here. Twitter recently optimised the username to display the username first, so in Google you’ll see ‘Chris Lake (lakey) on Twitter’. Very helpful. 301 redirects are what you’re looking for. I use Bit.ly, which works very well and provides permanent 301 redirection on its links. Others aren’t so generous, willing, or able. Search Engine Land has a great chart to help you choose one. There is a horrifying trend towards ‘framebars’, which sit at the top of the page and make your world slightly worse. They can have all manner of implications on SEO, not to mention the user experience. The Digg URL shortener is one that has put Digg firmly into ‘jump the shark’ territory for me, and created controversy a few weeks ago. It’s like a nuclear arms race, when everybody involved should know better. Many of the URL shortening services allow you to customise the link (e.g. ‘Bit.ly/customisethisbit’) but it’s not going to help with SEO specifically (due to the nature of the redirection). It might help persuade humans to click the link, but that’s the long and short of it, as far as I can tell. Twitter is about sub-folders (e.g. ‘twitter.com/lakey’) rather than sub-directories (e.g. ‘lakey.twitter.com’), so Google love is passed down through to tweets. As such we’re seeing individual tweets ranking relatively highly in Google, typically for long tail phrases. Prop it up. Give your Twitter homepage some linklove from your site. Let your audience see it and help them embrace it. Our own Twitter experiment, rolled out on a whim one Friday in March, was based around the notion that we’ll let people talk about us on Twitter and then feature their tweets on our homepage. We then tweaked the code to pull in mentions of specific blog articles (these sit in the blog sidebar, labeled ‘Twitter Buzz’). Further integration is planned. It is about driving engagement and participation, on our site and on Twitter, and also acts as a great feedback channel. All of this helps feed some of the other things I’ve talked about. What do we mean by nanocontent? We mean the first 11 characters in your tweet / headline. Consider that Google will be able to index part of your tweet in its results headings (the first part). This is a likely SEO ranking factor and it’s persuasive, from a human perspective. Front load those keywords where possible. More on nanocontent and online copywriting here. I’m not a believer in the so-called wisdom of the crowd, but I do think that crowdsourcing has cemented its place in modern business. 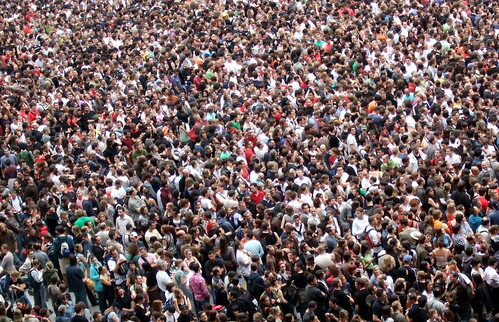 Crowdsourcing, as you probably know, is a way of using ‘crowds’ to ‘source’ solutions to your problems. What have you crowdsourced lately? Nothing? Well, if you run a website and have embraced user-centricity then think again… perhaps you have conducted user testing? Well, that’s crowdsourcing – asking the crowd for feedback – and it beats a top-down policy of allowing your board to design the website. Of course there’s more to life than usability testing. So what else can be crowdsourced? It turns out that there are plenty of dedicated crowdsourcing services that can be used for businesses. I’ve collated a bunch of the best ones, and some of them are really great. Future news organisations, the ones that make it out of the recession, will look much different than pre-recession times. They’ll be smaller and leaner. But if they’re smart, they’ll also have a big role in VC for companies developing products that could help them gain a competitive advantage.